We are pleased to announce that FoodTechAfrica has been selected by the Netherlands Ministry of Foreign Affairs, The Punchy Pack and the Dutch Development Bank (FMO) as the successful ongoing Public-Private Partnership at ‘de Partnership Verkiezing’ 2016. ‘De Partnership Verkiezing’ is an initiative of the Ministry of Foreign Affairs, The Punchy Pack and the Dutch Development Bank (FMO). 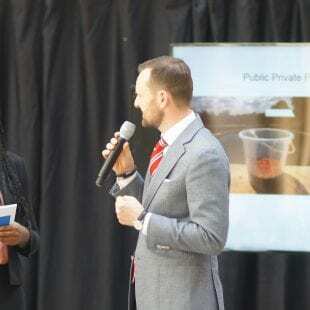 At the event in The Hague, FoodTechAfrica was highlighted as an example of a successful ongoing Public-Private Partnership by Zarayda Groenhart (former presentator BNN). Wouter van Vliet (Partner at Larive International) presented his personal experience on stage about the challenges and rewards of driving a successful partnership of both private and public players, with one common goal. FoodTechAfrica is a public-private partnership aiming to improve food security in East Africa through the establishment of a fully integrated aquaculture value chain. East Africa’ growing population results in an increasing demand for animal protein. Applying Dutch technology and knowledge to the African context results in sustainable local fish production that offers substantial opportunities to improve food security and contributes to economic development. FoodTechAfrica relies on the trust vested in the partnership by the involved entrepreneurs, companies, knowledge institutions and partners throughout the aquaculture value chain. These include the Netherlands Ministry of Foreign Affairs, Nutreco, Ottevanger Milling Engineers, Unga, Kamuthanga, Almex, Lattice Consulting, Dinnissen, The Roost, Fishion, Holland Aqua, Viqon, WUR (LEI & Imares) and the Embassy of the Kingdom of the Netherlands in Nairobi. Being selected as an example is a great impetus to continue our work on building consortia focused on selected markets in Asia, Eastern Europe and Africa. Working closely together as a consortium lowers the barriers of entry, fosters sharing of expertise and most importantly provides our local partners with the essential lessons learned by the Dutch companies and knowledge institutions. After having started successful partnership in India, East Africa, Indonesia, Russia and Myanmar, we will develop new consortia in close cooperation with the Dutch Private Sector and Governments.